The tomatoes are still doing OK but we've probably hit the high temps that means no more fruit will set for a while. I'll check the corn this week. Small looking ears but I didn't thin them properly. We've already decided for next year: all Cherokee tomatoes; no corn; lots of zucchini since they seem to be hard to kill. Anyway! 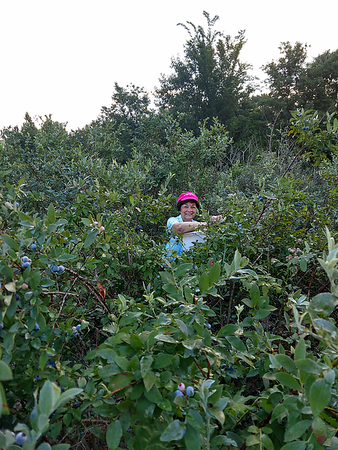 Since there are no garden pictures, instead I have pictures from the blueberry picking on Saturday. 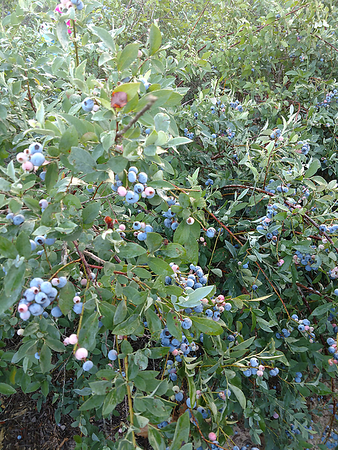 Moorhead (sic) Farms has much acreage dedicated entirely to multiple varieties of southern-climate-tolerant blueberry bushes. The season is about 6 weeks. The current cost is $2.50/lb (which is 16 oz for those not using imperial). In the stores right now the (usually from other states) blueberries are $3 for maybe 8-10 oz. Entirely apart from the price, the farm is a you-pick location. You get to sample from the bushes as you pick, and the farm provides buckets for you to hold the berries until you leave, whereupon they weigh the berries and charge you accordingly, and bag them for you. We bring our own wagon, it's leftover from when the kids were babies and my late grandmother bought it for them. It's still super useful. We brought a small cooler with water & tea in it, to ride in the wagon as well. We wore sunscreen and it was probably a good idea even though it was very overcast and the sun didn't come out until we left. It's an hour's drive there so we left about 5:30 AM. They open at 6:30 am and last Saturday was the opening day of the season. We get there early partly because of the heat (daytimes are mid 90s now and climbing) and partly because of the crowds - at 6:15 (we overheard), there were already 30 people waiting to get in. We went all the way to the back of the farm, because a lot of people just stop close to the entrance. We went alllll the way back, found a good spot and basically just worked on the same 4 bushes for 1 hour 20 minutes. 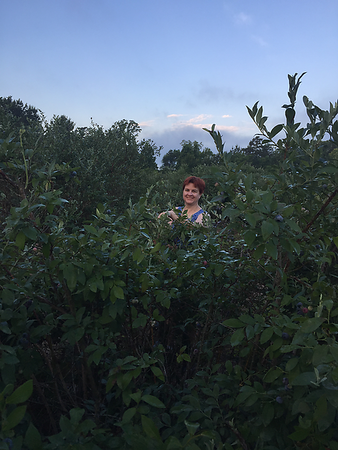 Me surrounded by blueberry bushes! The kids didn't come this year. :/ I like the entire social aspect of this tbh. Lots of people bring their kids and families with them. I can take or leave blueberries, tbh. I never even ate them before we moved here, because my prior exposure had been to those blueberry "jam" bars in stores that are just gross. 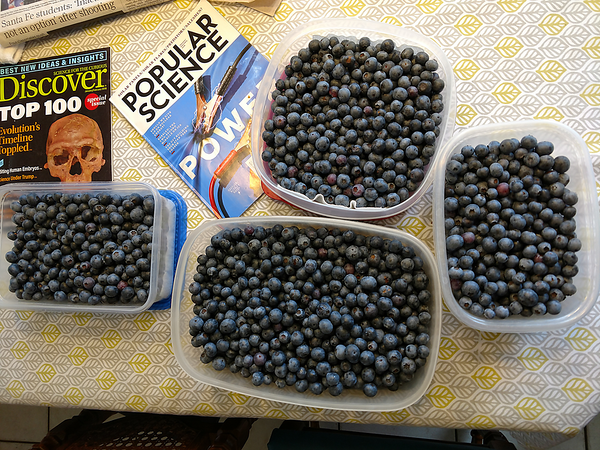 Anyway, in that 1 hour 20 minutes, Mom and I filled 2 big buckets, giving us 21.68 lbs, or $54.20 in blueberries. Which we then took home, set out to dry a little (they were covered with morning dew when we picked them), picked out the stems and leaves you inevitably get when doing this, and then figured out where to put them all in the freezers. Picture of a bush before I began. There are a lot of unripe pink ones as well. This is about half of our take, cleaned and ready to go into the freezer. They don't stick together when frozen, if they're dry when they go in. Magazines for scale, I guess. And this should be a year's supply for us. I wish there were other you-pick places nearby. I mean, there are some, but the prices are usually either higher or they're harder to get to or they're otherwise not cool to visit (like "you can't sample, you can only pick X amount" etc.). At Moorhead's, people are having a lot of fun, the kids are playing, people even have picnics right outside the farm. This entry was originally posted at https://laridian.dreamwidth.org/2902078.html. Please comment there using OpenID. My grandparents had some blueberry bushes, but I didn't like blueberries at the time. What a shame. I used to go cherry picking every May. Sometimes we'd hit other fruit orchards as well, but cherries were my favorite. If I could go cherry picking I totally would, especially sour cherries (the best for pies!). No cherries this far south, though. I did make blueberry muffins tonight though!